2nd Edition available Spring 2019! In this second edition of I'm Right and You're an Idiot , James Hoggan grapples with this critical issue, through interviews with outstanding thinkers and drawing on wisdom from highly regarded public figures, including the Dalai Lama, Thich Nhat Hanh, Noam Chomsky, Carol Tavris, Joan Halifax, and Carole Cadwalladr, to name a few . The importance of dialogue, empathy, and pluralistic narrative reframing arguments to create compelling narratives and spur action. The most pressing environmental problem we face today is not climate change. It is pollution in the public square, where a smog of adversarial rhetoric, propaganda and polarization stifles discussion and debate, creating resistance to change and thwarting our ability to solve our collective problems. An insider's view of how the energy industry has fuelled a bogus controversy about climate change. 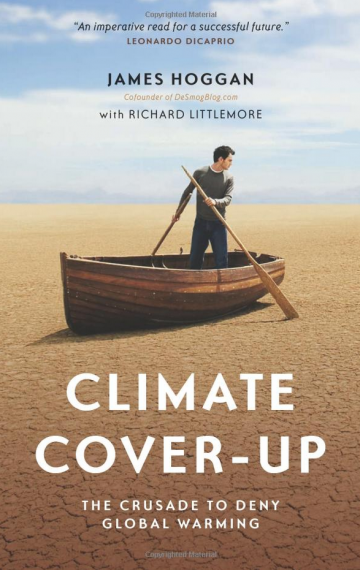 This book rips the lid off the campaign to discredit scientists, confuse journalists, and deny climate change. The tactics have been slick, but PR expert James Hoggan and investigative journalist Richard Littlemore have compiled a readable, accessible guidebook through the muck. Beginning with leaked memos from the coal industry, the oil industry and the tobacco-sponsored lie-about-science industry, the authors expose the plans to "debunk" global warming; they track the execution of those plans; and they illuminate the results—confusion, inaction, and an epidemic of public mistrust. In the age of cynicism, this is a refreshing book of PR tips, tactics and strategies for earning customer trust, employee loyalty, and goodwill among all those who are important to your business. In the current climate of mistrust people are not just tired of cute advertising and glib PR spin; they are openly hostile. People have grown disillusioned and distrustful --and if people don't trust you, it is very difficult for them to hear what you are saying. You can't buy credibility or invent it overnight. You have to earn it. You have to establish your reputation carefully and over time. In "Do the Right Thing," public relations professional Jim Hoggan has boiled the best lessons of an award-winning career into 200 readable and practical tips on how to make yourself understood in a noisy and confusing world, and especially how to gain and maintain public trust--not with press releases and spin, but by doing the right thing. This is "news you can use," a collection of easy-access advice outlining techniques have proven "right" for Hoggan clients and will work for you in framing your message, courting media coverage, building a good media relationship, communicating in crisis, planning for crisis management, communicating with investors, using social media to move your message from confrontation to conversation, making the most of every presentation, knowing your audience, recruiting friends and influencing critics, and communicating with your employees. For those who want to dig deeper into the public relations strategies, "Do the Right Thing" delves into some worrying research and case studies on how - and how badly - the PR industry has lost the public's trust. It then looks at the emergence, and the importance, of social media and at the best current research on communications strategies including storytelling, framing, dialogue and persuasion. "Do the Right Thing" is a book for everyone who cares about his or her reputation, personal or corporate. It's a guide for every person or company that cares about communicating credibly with a larger audience. The tips, techniques and tactics, developed over three decades, are as useful, as effective, and, especially, as concise as possible. Read it knowing that Jim's own PR reputation is built on performance. He has shown time and again that if you want employee loyalty, consumer trust, and a degree of public regard, you have to earn it, nurture it and maintain it.